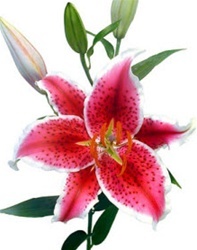 The Starfigher is a large, very fragrant oriental lily. Deep red overtones and crisp color lines add a feisty flare to this relative of the ethereal stargazer. Deep red-pink petals with a defined white border and only slight ruffle. Generous burgundy freckling, orange-pink pistil and filaments, orange pollen. Unusual, well-defined three pointed chartreuse center star. Height 26 to 36 inches. Free Shipping! Abundantly large, very fragrant orchid lily. Orange overtones and crisp color lines add a feisty flare to this relative of the ethereal stargazer. Deep orange-pink petals with a defined white border and only slight ruffle. Generous burgundy freckling, orange-pink pistil and filaments, orange pollen. Unusual, well-defined three pointed chartreuse center star. height 26 to 36 inches.